Yup, Yup, Yup, Nope, Yup, I think that house is empty, Yup, Absolutely Not, Yup, I think a murderer lives there, Yup, Yup. I mentally noted each house as I zipped passed them on my small purple Schwinn with the pedal breaks. I was canvasing my route. I’d lived in this neighborhood since I was 4 and I knew exactly which houses to hit when the big day approached. I thought of what I was going to wear. Mom, who wasn’t the least bit crafty, wasn’t going to make anything. She was also thrifty, raising 4 kids on one income, so she certainly wasn’t going to buy me anything new either. I thought about what my friends wore last year and I wondered if I could borrow something. I couldn’t bear another year of being the non-politically correct hobo. This was Halloween. You go big or you go home. When Halloween arrived, I had my route mapped out. This was before city government’s stepped in and forced Trick or Treat rules and timetables on us. You got home from school, you changed into your costume and you were out the door before 4. My brothers and I were old enough to hit the immediate streets without parental guidance. We made our first rounds, then returned at dusk to empty and assess our earnings. Someone new moved into the corner house on Sequoia Drive. A dentist. Toothbrushes? No thanks. Next year that house will be skipped. As the sun set, we struck off, usually with Dad, to the next neighborhood over. These were the bigger, nicer houses equaling bigger, nicer candy. Mini Snickers and Reese’s Peanut Butter Cups were passed out instead of lame candy like Smarties, or those weird orange and black wrapped taffy’s. And then there was the big brown house. The one with the pool and waterslide in the back. The one that passed out the ultimate Halloween Candy prize. 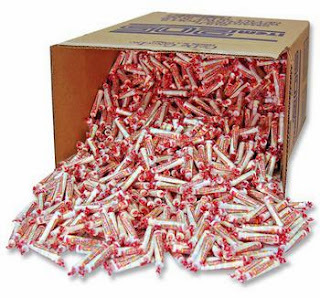 You got to that house early, before they ran out. 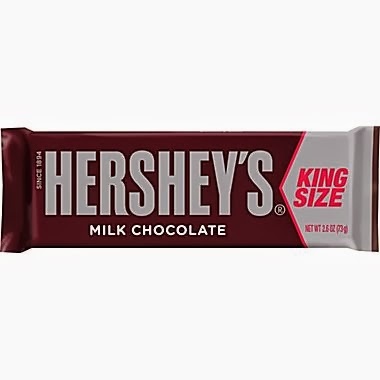 Every kid went there because every kid new they passed out King Sized Hershey Bars. 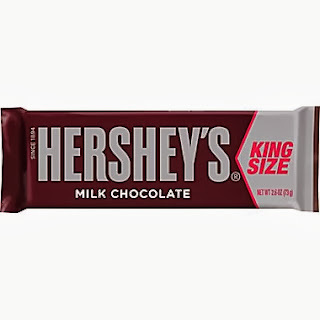 King Sized!! No one else passed out full sized anything let alone King-Sized. Hershey bars weren’t even my favorite but the novelty of a full sized candy bar was too exciting to pass up. Once we hit that house any other candy earned was just bonus. When we candy procurement ended, we headed home to count, tally and trade our wears. 3 Tootie Pops for a Milky Way. “Here Mom, you can have all my Smarties.” Mom then put all our candy up high, rationing it so we didn’t instantly develop diabetes. I did notice that my stash got smaller disproportionate to my rations. I’m sure Mom took more than the Smarties I so generously offered. Now I’m an adult and I’m walking my child around with candy. Soon he’ll be at the age where he can remember the best houses to hit up. I’m sure instead of hating on Smarties, Max will be disappointed by the house passing out vegan, gluten-free, Paleo treats from Whole Foods. He’ll be polite and say thank you since no one has to participate in the Trick or Treating. But when he skips the house the following year, I won’t blame him. This post brought to you by Mama Kat's Writer's Workshop! Ha! I totally remember going out right after school, coming back home for dinner and going out to both sets of grandparents neighborhoods later on. Where we live now the kids only have a two hour window for trick or treating.